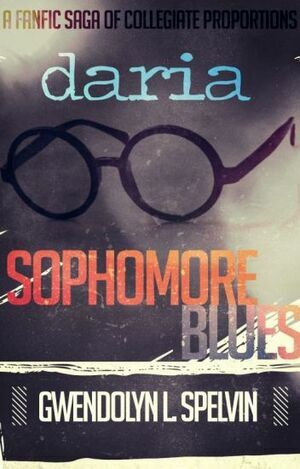 Daria: Sophomore Blues is a fanfiction novel created by Gwendolyn L. Spelvin. It is canon, taking place after the conclusion of the MTV Series during Daria Morgendorffer and Jane Lane's Sophomore years in college. It is featured on the https://archiveofourown.org/ Archive Of Our Own website. Daria Morgendorffer has just survived her Freshman Year at Raft University, and is hoping like hell not to repeat the same boring mundane experience as a sophomore. In an effort to assert herself more into the world, Daria bites the bullet to move off campus and get out on her own. After making amends of their past over their mutual ex, her best friend Jane Lane joins her on this quest, still hanging in at Boston College Of Fine Arts. Everything seems to be fine, until life unexpectedly changes without a moment's notice for Daria, forcing her to explore her newfound independence in a way she never imagined would ever happen. As she starts living her life for the first time without anyone's preconceived notions, she truly realizes that while she's a better woman for the experience, change hurts. Spelvin announced in 2017 she would be writing a follow-up to the fanfiction novel, featuring other characters in the Daria universe. As of 2018, she's only 20 chapters in. The novel can be found on the AOW author works here. This page was last edited on 19 August 2018, at 09:43.